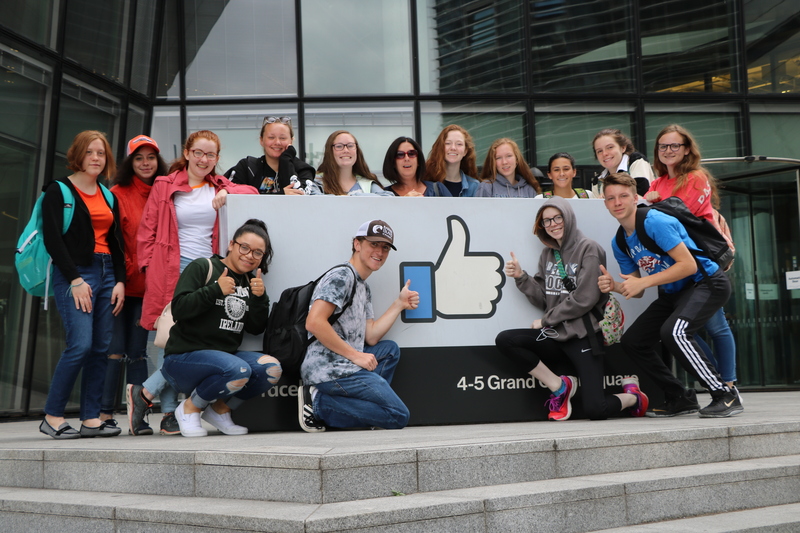 It’s certainly ironic that almost none of our students have accounts, but today only proved that you don’t have to be on social media to appreciate the monumental force that is Facebook. We visited their headquarters for lunch and a tour. One of our 2004 alumni Eric Shadowens works here in Dublin and we had the absolute pleasure of being shown around the facilities. Funnily enough, Eric is also one of Clare’s family friends and she only realized that after meeting him! We began with an absolutely delicious lunch that was themed after French cuisine. As you can imagine the kids lost it when they saw all of the amazing desserts. We met some of Eric’s coworkers and started our tour. Of course, we could not interrupt the daily work lives of the employees, but we toured recreational spaces. The design and thought that went into the office itself was remarkable. There were air purifying plants everywhere, plus very carefully constructed light and sound features. At Facebook, the balance between work and play becomes blurred to enhance creative thinking. Our tour started on the upstairs level right next to a Lego wall where employees could spend time creating. Our students made their own marks too — writing their names, or just creating aimlessly. We learned about some of Facebook’s initiatives to become more green-friendly and to work with satellites to spread internet access. 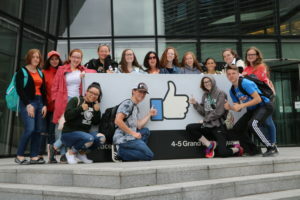 After we bid Owen a farewell (with some students threatening to just stay in the cafeteria for the rest of the trip), we headed down to the small square between Facebook and our next destination for a quick coffee. 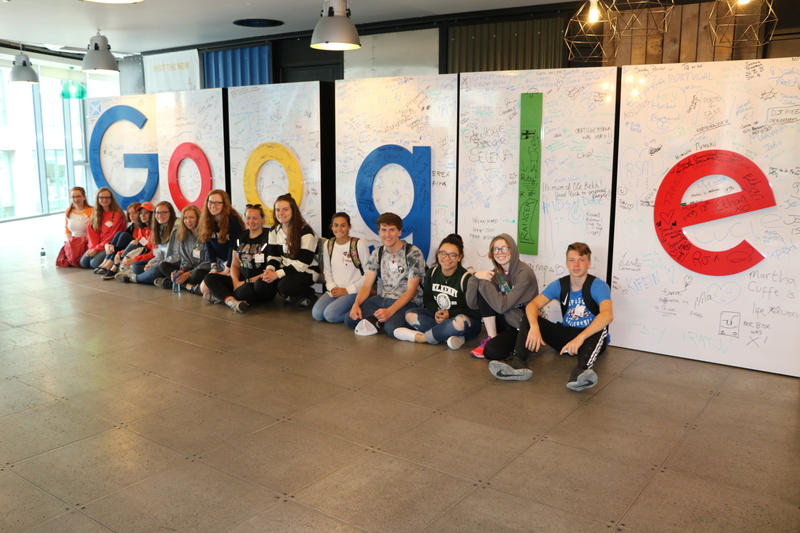 The next stop on this technological roadshow was at Google’s headquarters. We were welcomed warmly and toured a facility very similar to Facebook’s, but slightly more formal. There was also an official Google souvenir shop, where a lot of the girls bought matching sweatshirts. We headed home for a delicious dinner and our last drama sessions before final presentations tomorrow. However routine this might sound, after drama tonight became one of the most iconic nights of the ILE: the talent show. Our students had a diverse selection for us — from Nancy singing “Bear Necessities”; Anna singing the iconic “Pure Imagination”; Ethyn doing magic tricks; and Joe dancing (??) with bubbles, among other performances. The staff even participated, chiming in with a few traditional ILE songs. To finish off the night, Eric rejoined us with his bandmates Matteo and Eddy for a session and they regaled us with traditional Celtic tunes. They sang a very timely rendition of “Grace”, which recounts the heartbreak of Joseph Plunkett and Grace Giffords. Joseph Plunkett was a hero of the 1916 who married Grace not even hours before he was executed in Kilmainham gaol. 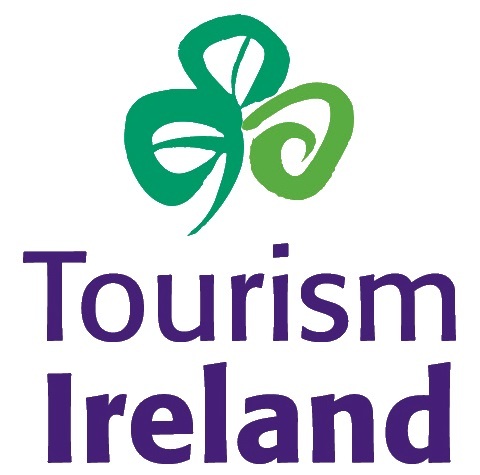 We will be visiting the GPO and Kilmainham tomorrow. There was not a dry eye to be found. However, other classics like “Whiskey in the Jar” cheered the room up considerably. After the session, students went off to bed contemplative and exhausted from a long, spectacular day. Our stay in Dublin has almost come to an end. 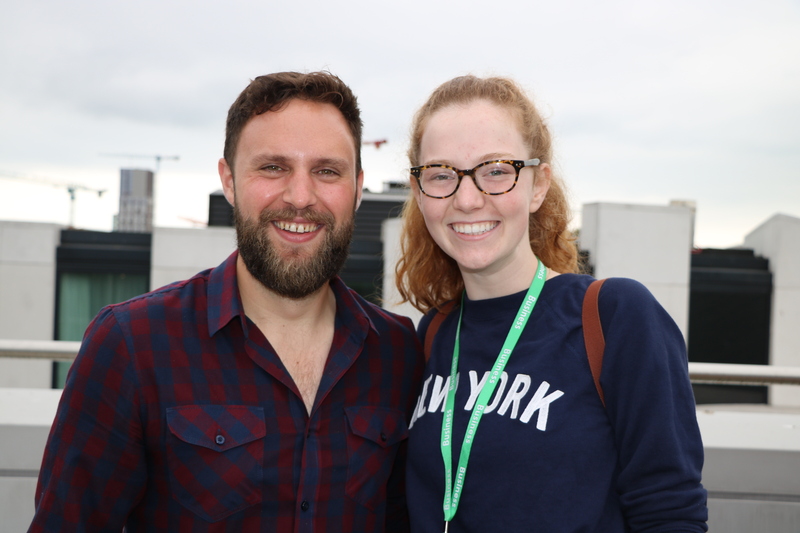 Next on the list of our adventures was…the Guinness Storehouse and Factory tour! This location at St James’ Gate has brewed since 1759 and their museum is shaped like a massive pint glass. We ate breakfast first and then headed down to the quays on the Liffey to tour the facility! Contrary to popular belief, Guinness is not brewed with water from the aforementioned Liffey but instead with mountain spring water! The tour opened with exhibits on the ingredients that make Guinness so unique and apparently two-thirds of all Irish grown barley are purchased and used by Guinness in their brewing. After ascending floor after floor, we learned more about the Guinness family and the art of brewing. I think one of the student’s favorite floors was the one entirely dedicated to the famous advertising campaign that so universally endeared them. The “A woman needs a man like a fish needs a bicycle” quote was a big hit with students, especially upon discovering it on a t-shirt in the gift shop. Allison was very impressed. 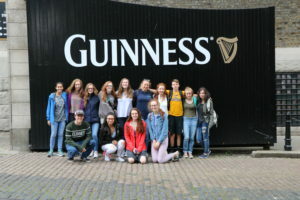 None of the students were allowed to sample the Guinness but several did buy coffees or chocolates from the gift store. After Guinness, Mike showed the students around the heart of Dublin. This tour featured the statue of Oscar Wilde in Stephen’s Green, the National Museum of Archaeology and Trinity College. The students then split off, with a group going to the museum and another group heading into the city for food and shopping. I’m not sure if anyone has been following the news lately, but there was a certain couple in Dublin at the same time we were…and myself, Issie and Caitlin saw…Prince Harry and Meghan Markle!! Unfortunately, none of us managed to get pictures but we saw them in the motorcade — and that’s what counts! Clare and Paige were deeply upset that they didn’t see them. 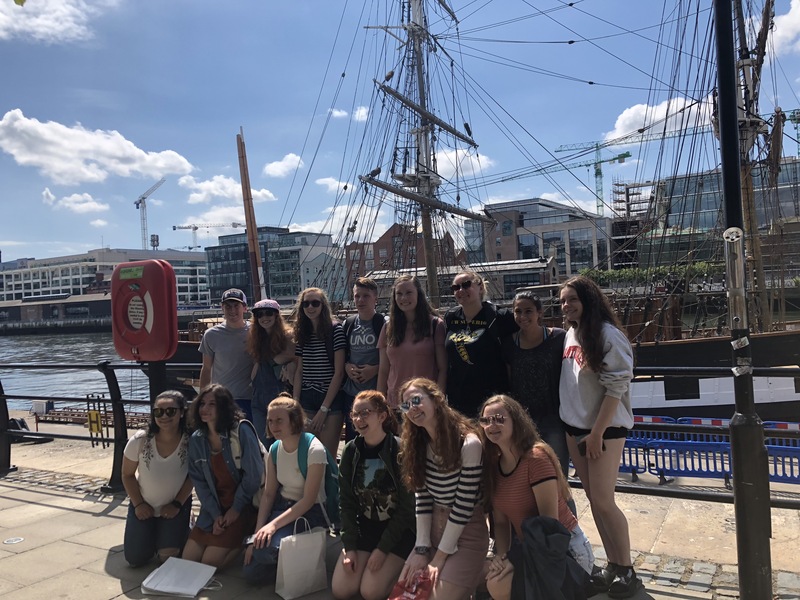 Most students spent their time exploring the city, ducking into coffee shops and looking for the various statues and historical markers dotting the streets. We headed back to King’s Hospital to relax and unwind. It was a long but fun day! We are slowly starting to wrap up classes this week. No one can believe how fast time has been flying by. In class, all of the students presented on Irish or Irish-American figures of their choice. Counselors Miles and Taryn were blown away by their preparedness and humor. Several students also did family members or local immigrants. Angie has also slowly been readying herself to cover James Joyce and continues to inspire students to seek out Irish literature on their shopping trips. Our teachers cover a diverse range of topics in their lectures, from slang to pop culture, and it makes us all so happy when our students really engage with the material. After classes and lunch, I presented my optional workshop: an Introduction to Celtic Mythology and Folktales. I was so excited to prepare this because for the past year I have focused my studies on modern mythologies and the structure of fairytales. I am so pleased and grateful that so many students came to hear me babble about one of my passions! 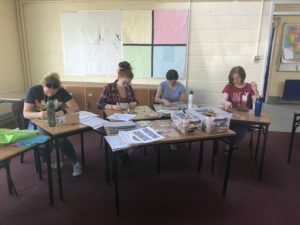 We covered a basic idea of the soul and death, some specifically Irish gods and goddesses, the evolution of mythology and the four cycles of Irish mythology. I especially wanted to focus on the Tain bo Cuailnge or the Cattle Raid of Cooley from the Ulster cycle, which is one of the most important pieces of Irish literature. Anna was very interested in the goddess known as the Morrigan and I happily provided a recommended reading list. After that, the students had a workshop on genealogy with Taryn and Miles. Students received images of family crests, name meanings and locations of origin. I always feel the need to emphasize that even if a student has no Irish heritage or is unsure if they do, they should still apply for the ILE. 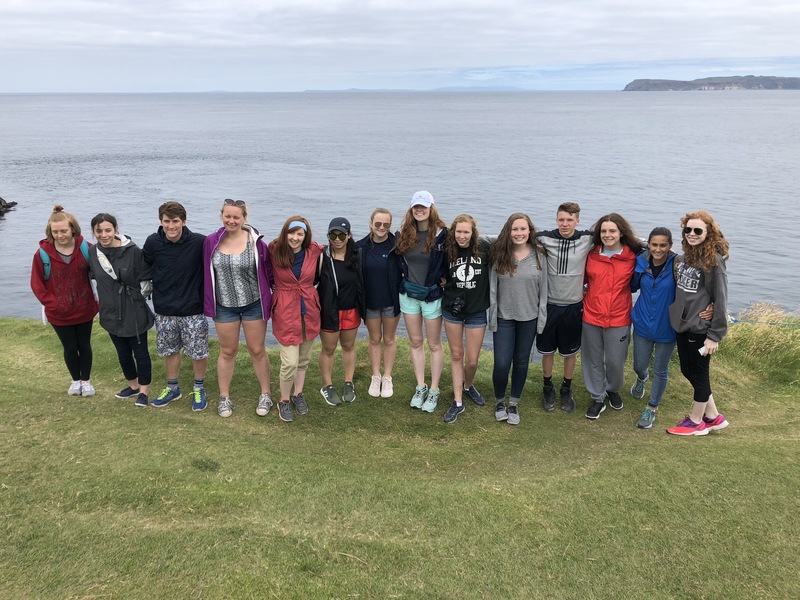 This is a program about education and appreciation — you don’t have to be Irish to be entranced by the beauty and history of this island! 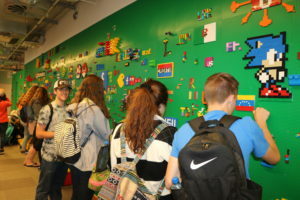 After doing workshops, students had more free time at the Liffey Valley Shopping Centre. We have noticed that the girls are all slowly getting the same pastel pink skirt from Penney’s and it just cracks us all up. Of course, some students chose to nap or putter around the grounds of the school. In dance, students continue to practice fundamental jigs and soon Casey will be offering her Advanced Irish Dance workshop. We have some really talented kids this year in particular and the staff are so glad they’ve been having fun with it! Family and friends, please ask your kids to show off everything they’ve learned when they get home! 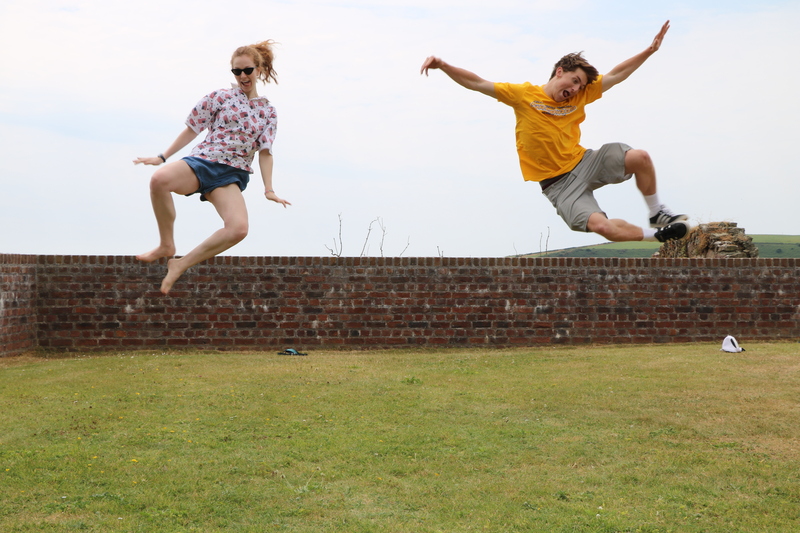 And of course, today we went to see the world famous Riverdance. All of the kids dressed up in their best and they had front row seats!! Everyone was just enthralled, even if they had seen it before. Of course, for Clare and Paige the highlight was the principle male dancer — who winked and smiled at them! Everyone came back to King’s Hospital in a music-induced daze and we all fell asleep early. 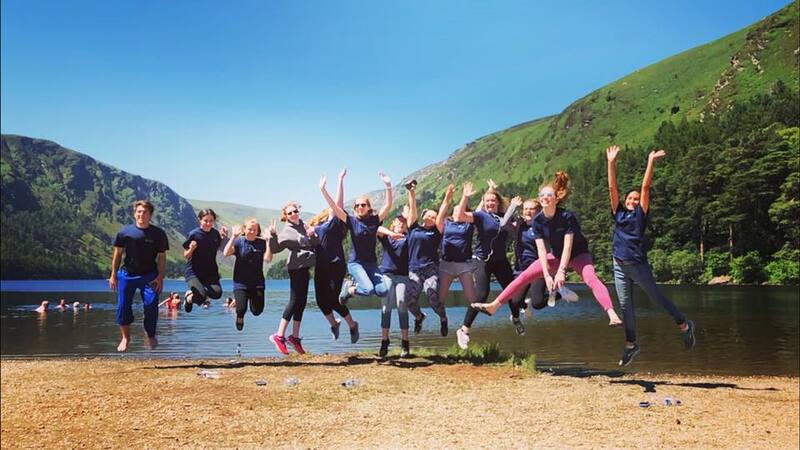 Despite a brutally early wake up and a short breakfast, today is universally regarded as one of the most exciting and rewarding days of the trip. This is a day that almost becomes spiritual as students immerse themselves in the beauty of nature. Our destinations today were in Northern Ireland! 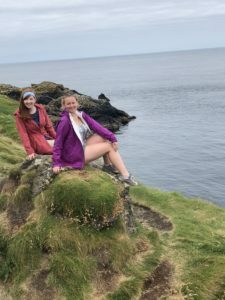 Our drive was around three and a half hours long and we drove up past Belfast to stop briefly at the ruins of Dunluce Castle for the kids to observe what the old archaeological site looked like. From there, we could look out at the horizon and see the Giant’s Causeway. After taking a few pictures, we boarded the bus again and went to Carrick-a-Rede first. The famous rope bridge here links the mainland of Ireland to the tiny island of Carrickarede, inhabited by gulls and fulmar. To get to it, we walked along a narrow paved path that hugged the curve of the coast, bordered on each side with wildflowers and grasses. The sea air was deeply refreshing. All of our students crossed the rope bridge with no anxieties at all! Once on the island, we had a lot of free time to sit and contemplate. The students gave us all small heart attacks by posing near the edges but there were no mishaps and they were under our eagle-eyed gazes the entire time. 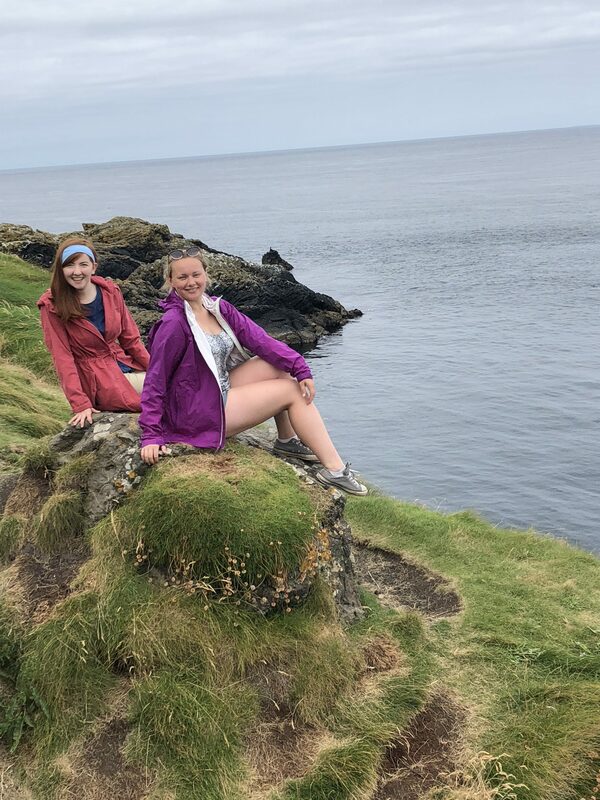 After experiencing this, Clare and Kennedy are excited to see the essentially similar but uniquely striking Cliffs of Moher in the upcoming weeks! I think after the bridge and the associated hike, the students could have fallen asleep quite happily and called it a day — I know I did — but we persevered! 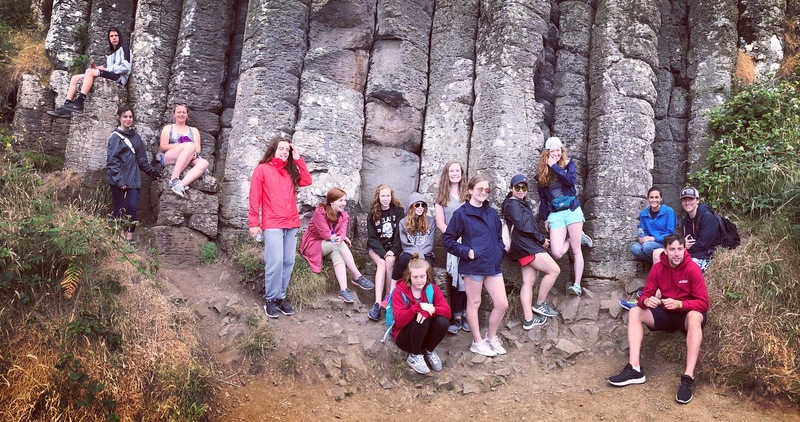 Next up was the famous Giant’s Causeway. Legend has it that Irish hero Fionn mac Cool created the bridge to fight a giant in Scotland, but upon realizing his size Fionn ran back along the Causeway so fast it disintegrated under his feet. 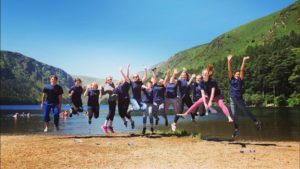 The students walked the very long and scenic route down the coast and rocky beach. It was a very windy day, but almost perfect weather for the hiking we were doing. Some students hopped from rock to rock to get all the best photos and others were content to sit and relax. We spent extra time here to explore the tide pools and rock formations. After the hard work the students put in to get to the Causeway, they had more than earned some time to themselves. Once finished, we went down to Ballycastle for dinner and relaxing! The staff and a few students ate food from Morton’s Fish & Chips which was absolutely incredible. Students enjoyed the sunshine and hung out around the beach. Ballycastle has an atmosphere of complete relaxation and it was a fitting end for a long and strenuous day. We got back to King’s Hospital around 10 pm and the students went straight to bed. 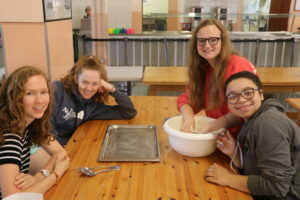 Breakfast today went as breakfasts usually do — featuring the hurried munching of cereal, grumbles about the other students staying here who had eaten all of the waffles, and students slowly rousing themselves from their stupors. Once sufficiently awake, it was time to get going. We hopped on our bus to head into the heart of Dublin for our first real taste of the city. A recent addition to the cultural scene is the EPIC or the Irish Emigration Museum. This museum is almost entirely digital and the very first of its kind. Upon arrival, we were given museum “passports” that we could stamp at all twenty exhibitions. Some of these exhibits included topics like music, dance, sports and literature. I had multiple students come up to me and comment that they could have spent at least four hours here and were disappointed that they only had a little under two. Each room was laid out in some unique fashion and furnished with screens, lights, painted patterns on the floors or sculptures. One of the rooms that fascinated the kids the most was the “whispering library”, where pages could be flipped on interactive screens and narrators would whisper pieces of literature written by Irish authors. It was quite atmospheric. Anya said that her favorite part was the display on art and culture but wished that there was more to it. 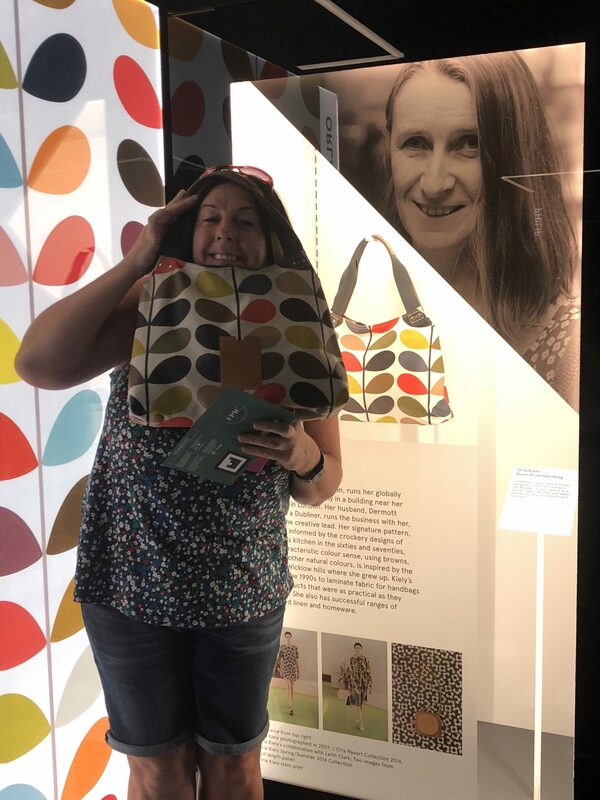 I think that might have been Angie’s favorite as well, as she discovered that her Orla Kiely handbag was actually on display in the museum! 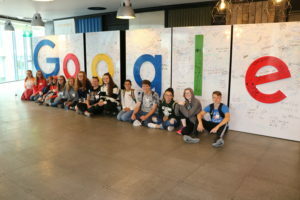 At the very end, there was a large display where students could type and send virtual postcards to friends and family, and I believe many students took advantage of this opportunity! Unfortunately, the separate exhibit on families and genealogy was closed. However, students will have an opportunity later in the week for a workshop with Miles and Taryn. On our walk back to the bus for the next leg of our jaunt, we walked past the replica of the ship Jeanie Johnston, which was originally used to transport emigrants as the students learned in their history lessons. Safely ensconced on the bus once more, our next trip was for a brisk walk around the Howth peninsula. Howth is a beautiful fishing town on the coast outside of the Dublin and students took their lunches out on the grass in the sunshine, admiring the many dogs walking past. 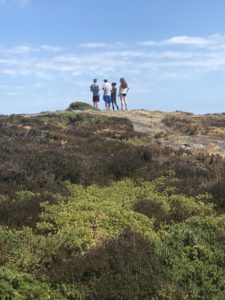 We walked about four plus (probably even more…) kilometres — just taking in the fresh sea breeze and the gorgeous views. 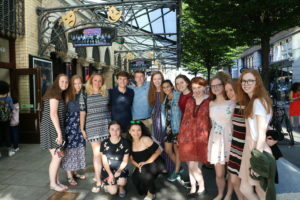 As a group, we spent a few extra minutes within the town itself to take in the glorious weather before heading back into Dublin. The group returned to Croke Park for the second time — but this time to visit the museum! The students watched a short montage of scenes about the preparation required for all GAA games, which I think really gave students an appreciation of the stadium. We got to access some of the top-most seats, along with a private box and a dressing room. All the while, students gossiped cheerfully with our guide about the recent performances of teams they’d heard of. 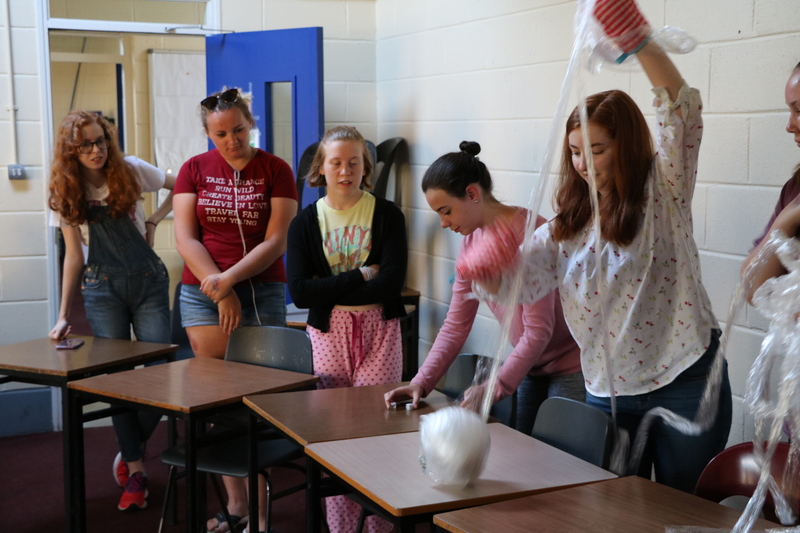 The students also tried their hand at a series of interactive games that were meant to be modeled after the physical requirements of GAA games to the glee of all involved. After we finished up, students caught the tail end of the televised rematch between Kilkenny and Galway with the eventual triumph of Galway. We returned to King’s Hospital for dinner, drama and dance. Not much is new on that front — the food remains excellent, the kids remain engaged and enthusiastic. Everyone can’t wait to present their final performances. The moment we have all been waiting for is here. 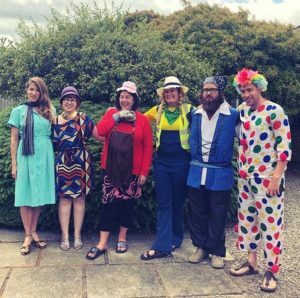 The long anticipated results of the staff thrift shopping contest. Out of respect for all the contests I am not posting pictures unless threatened with pain of death. Needless to say, humiliation was the end goal. 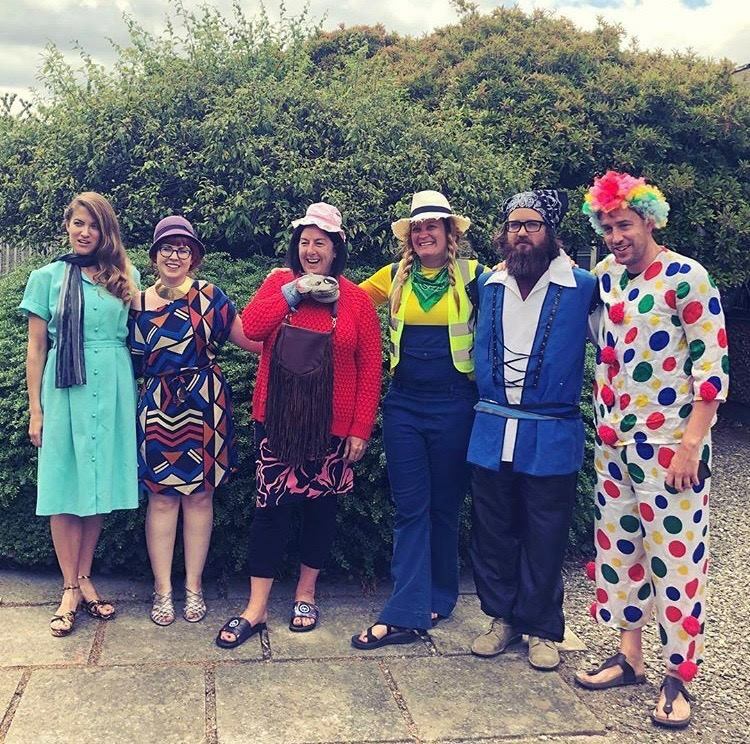 To explain more — the staff are taking part in a very serious competition amongst ourselves to gain points in the #ILE18 Staff Olympics. For this particular challenge, we all drew someone’s name out of a hat and then had a budget of €20. So we went down to breakfast thoroughly embarrassed. The students unanimously voted that Mike had worn his costume best. He did his best to teach through the cackles and that he did. That’s all anyone can do. But on a more serious note, all of our fantastic teachers have been very concerned with delivering as much intersectional information on Ireland as they can. From sociopolitical forces to pop culture and language, our teachers are helping students make connections that they will always be able to use for the rest of their lives. Every monument and museum we go to, the students ask intelligent questions or pipe up with a, “Hey, we learned about that in class!” We could not be more proud of the way they have been representing this program. After covering more history and literature, the students had a nice intellectually stimulating morning followed up by a free day at the Liffey Valley Shopping Centre filled with supporting the local economy. Clare, Paige and Kennedy walked back into the office dying of laughter after their jaunt because Clare had tried charcoal ice cream and was still covered in both the remains of that and bright red lipstick. In drama, we began to contemplate our big final presentations. 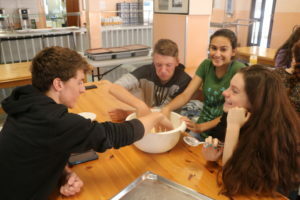 The students work among their groups to create some sort of short skit or play on a famous figure from Irish history. They are graded along the categories of historical accuracy, creativity and teamwork. 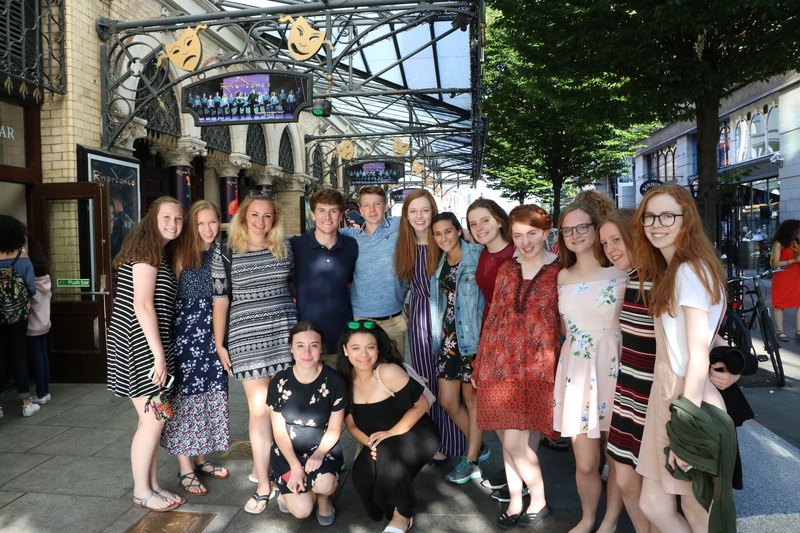 The presentations will be due on our last night in Dublin on July 13th. Everyone has successfully packed and loaded their things onto the bus and left the dorm rooms nigh on spotless. Bidding a fond farewell to Waterford and Newtown, we move on to new adventures. En route to Dublin we visited the Irish National Heritage Park at Ferrycarrig. We were greeted by our guide dressed in a very cool reinterpretation of Medieval men’s clothing, complete with what looked like a hand forged neck piece. We ate a quick lunch before we joined him for a short audio visual presentation that ran through a few basics of ancient Irish history. The video mostly focused on recent excavations of tombs like the Knowth passage tomb. After that, our guide told us that a boxer was filming a segment for a TV show here at the park and we got to walk past the organized chaos of it. But that was hardly the most interesting part of the hour and a half tour. We began in the Stone Age with replicas of prehistoric houses used by the first ancient hunter gatherers. From there we moved into the Bronze Age with its mysterious stone circles and fulacht fiadh (a cooking pit in the ground). 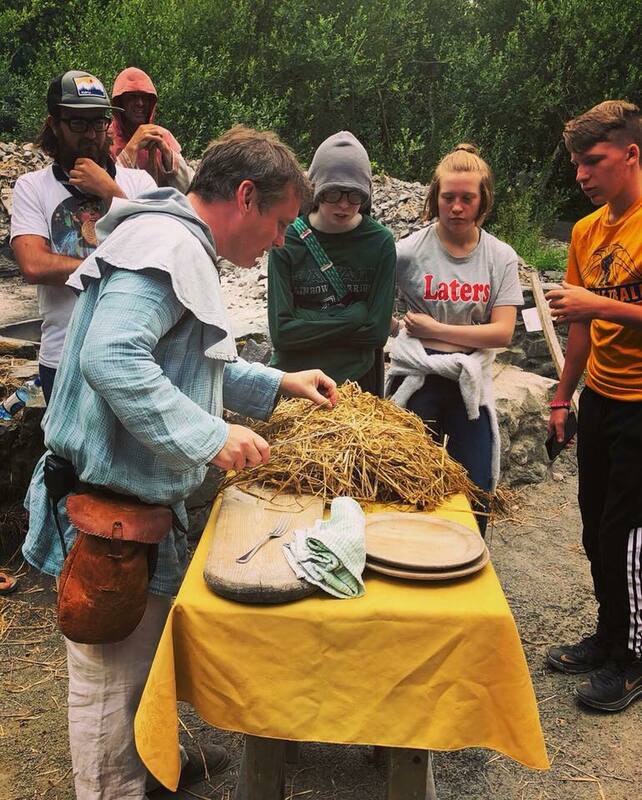 We actually got to try some ham cooked in the fulacht fiadh in the way archaeologists have theorized the ancients used to. That’s the sort of job I aspire towards — a research historian who cooks. Poor Mike was thoroughly abused today by staff and students alike. He is deathly afraid of stickers, so of course Taryn whipped a few sheets out from her backpack. Almost all of the students managed to affix one to his back before he noticed. Clare was especially canny and pretended to fall and catch herself in order to place hers. We also saw a replica of a ring fort and small monastic village. There was such an attention to detail everywhere we looked. Our tour ended with a replica of a Viking Longhouse and ship. We actually ended up running into a family that Angie was familiar with through the local newspapers: their grandson Connor is an up and coming soccer and hurling champion. It was very fun to have met someone so coincidentally. Boarding the bus, we buckled in for another long drive (or nap for some). After arriving at King’s Hospital, we had just enough time to allocate rooms before a hearty dinner. 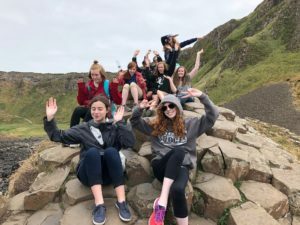 During drama and dance, the students continued to work on their music videos for Irish songs and on practicing the Haymaker’s Jig. King’s Hospital is significantly larger than Newtown and it serves as the summer school for lots of students studying abroad. Already the students have been hanging out with other groups and socializing. Hopefully, there will also be a disco during the time we are here! Now that we have access to more reliable WiFi, please continue checking the blog for photos and updates! This was probably one of our earliest days so far as we boarded the bus at 8:30. 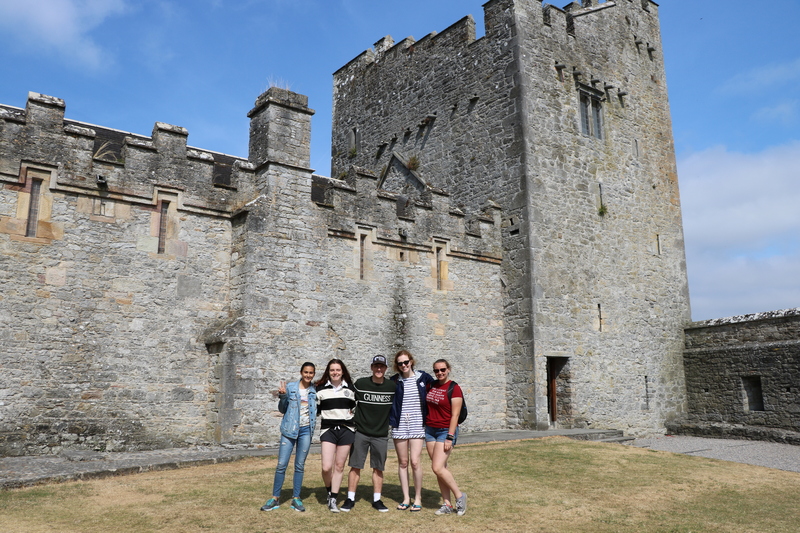 Our first destination was Cahir Castle which is the ancestral home of the Butler family. Cahir overlooks the River Suir and is encased by thick stone walls from which two cannonballs still protrude. A scene from Braveheart was filmed in Cahir using one of their gates. Another battle scene from the 1981 classic Excalibur was also produced here. Our guide took us around the inner keep and explained how the castle was made and how it came into the hands of the Butler family. Mike took advantage of that segue to inform students that he used to work at a church also owned by the Butlers! 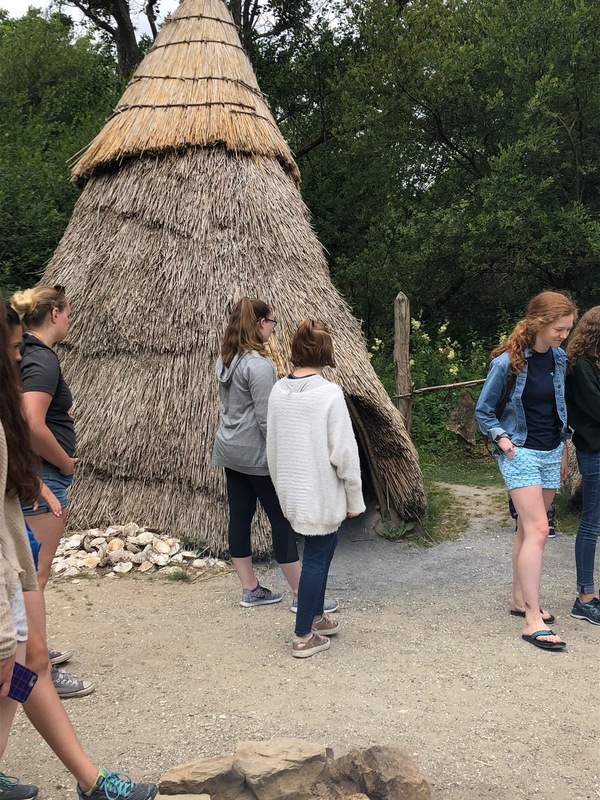 Using the power of language, our tour guide evoked vividly what Medieval life was really like for the highest and lowest ranking members of the household. Our counselor Miles’ favorite moment was the explanation of the function of the garderobe and how laundry was held over what can be delicately referred to as the communal toilet. Ammonia produced by the…disintegrating bodily functions would then kill any lice and mites on the clothes and leave them smelling of Chanel No. 2. More seriously, Cahir is a stunning place. In the great dining chamber, the rack of an extinct Megaloceros or Irish Elk was mounted on the wall, casting looming shadows that really transported the students to another age. We also learned, in a seemingly perfect call back from yesterday, that Cahir was often defended using superheated sands — not boiling oil as we had once thought! Our students seem to be amassing a wealth of knowledge on the defensive strategies of historical forts. To what end, I cannot say. 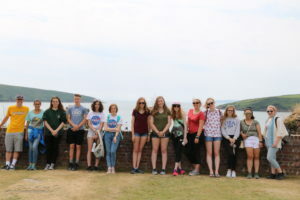 Students had the opportunity to explore the grounds after the tour had ended and go up into the towers for some fantastic views. There was also an exhibit on the roles of women during Medieval life in Ireland which was very fascinating. 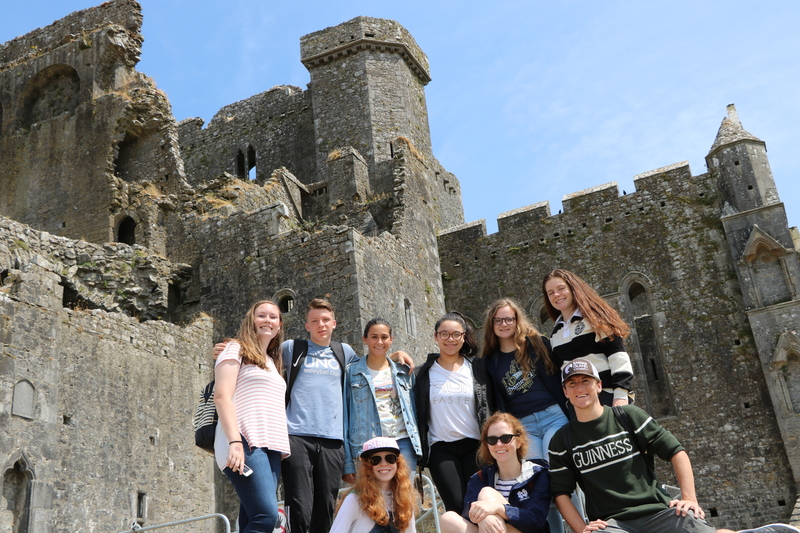 After Cahir Castle, we headed to the Rock of Cashel. The Rock of Castle is located on a promontory that local legends say was uprooted from the nearby hills by the Devil himself and spat out onto the land. The grounds contain a series of Medieval buildings — from the 12th century round tower, High Cross and Romanesque Chapel, 13th century Gothic cathedral, 15th century Castle and the restored Hall of the Vicars Choral. 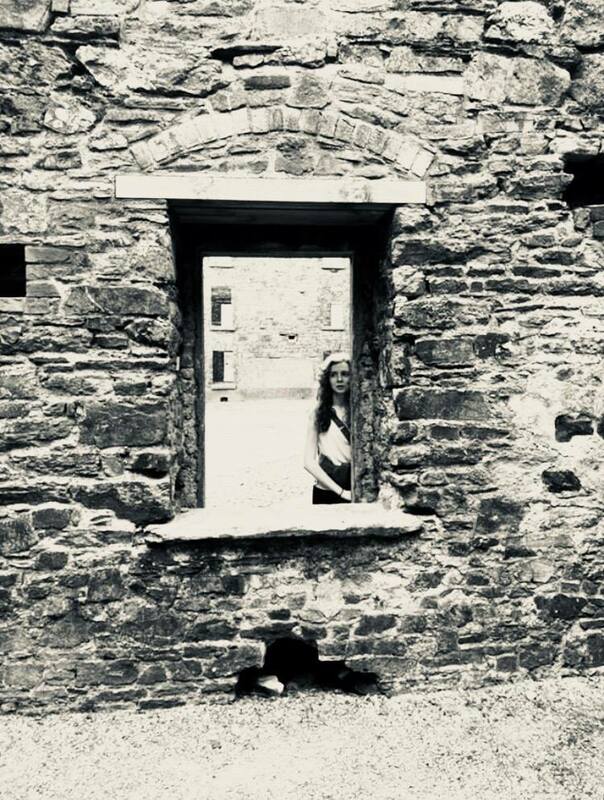 We were guided through the history of each and walked through the walls that held so many past lives. The ancient mural recently uncovered was particularly beautiful. 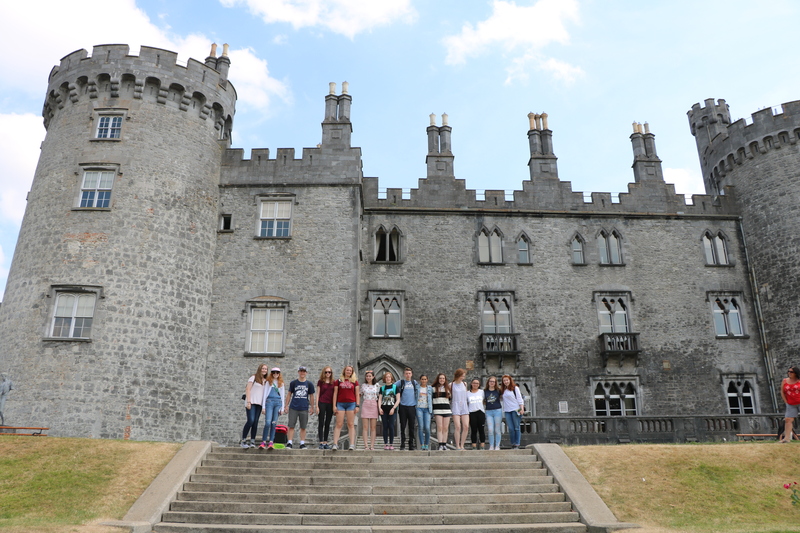 Once the students had satisfied their insatiable curiosities for knowledge, we went down into the town of Kilkenny. We used Kilkenny castle as our launch point for the rest of the afternoon. The kids had free time in the city to grab dinner and tour the round tower, city hall, and all of the shops and street exhibits. Nancy was particularly interested in thrift shopping and found a book on Irish politics! Anya found a “no parking” sign and just had to sit in front of it as per her family’s tradition. Casey gladly snapped a picture for her. The roads leading back to Waterford were quiet and traffic free. Students were either gently napping or contemplating packing up because tonight is our last night at Newtown! We made sure to pick up the staff of Newtown some potted flowers in appreciation of all the hard work they did to ensure that our students were happy and well-fed! We played a game of Taryn’s creation called Saran Wrap Surprise for our evening activity and honestly I don’t think anyone knows the rules to it. Everyone went to sleep early tonight to brace for a long day tomorrow! This was a very busy day! We started with an early breakfast full of protein-y goodness to sustain us for the day ahead. Our jam-packed schedule started at Charles Fort which is a 17th Century star-shaped fort on Kinsale harbor. Charles Fort was designed to be almost twice as large as it is today, but unfortunately the money ran out (as it does for so many public works). The star-shape was integral to defense as it allowed the men inhabiting the fort to send down volleys from all angles onto attackers. Our guide took us through the history of the fort from its creation to its recent, alleged hauntings. He also dispelled some common myths about the use of boiling oil during sieges: he said that inhabitants of the fort were more likely throw rocks rather than waste precious oil. 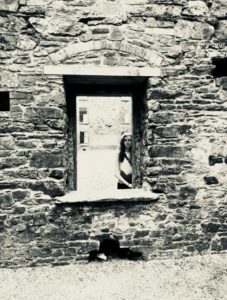 He also told us about some spooky photos taken by tourists at the fort a few years ago, photos that contained an unknown lady in white. As the story goes, the lady in white was a newly married bride whose husband was on her wedding day. She threw herself from the walls of the fort in grief. Of course, no one believes in ghosts any more…Or do we?? After touring the fort and taking some fun photos, we went down into the town of Kinsale with packed lunches and the students ate on the steps leading down to the quay and attempted to cause a seagull insurrection. After wandering around Kinsale for an hour, we got back on the bus to head into Cork City. The students had free time to shop and eat dinner. Nancy was particularly interested in thrift shopping and the staff helped direct her to a few. After everyone had eaten, the bus was loaded back up and we headed back to Waterford. 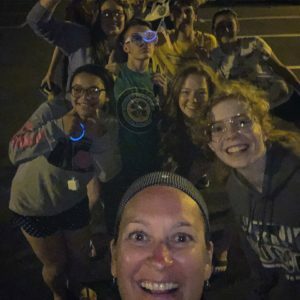 The staff hit the ground running when we got back in so we could decorate the movie theatre for the Fourth and order enough pizzas for everyone! Everyone tucked into pizza — someone really liked mushrooms and those of us who didn’t had to dodge around them on every slice! — and chips while we watched a movie. After the movie, armed with glowsticks and patriotic tricolor balloons, we ran into the soccer field to set off little sparkler sticks (which were very safe and well supervised)! Much fun was had by all. We started off with the fourth day of lessons! Today was more of a laid back day to complement our extremely hectic and fast paced week so far. The sunny weather just will not relent, and students aren’t sure if this is a good thing or a bad thing. Allison asked if it was supposed to be this sunny in Ireland and the answer is a resounding “no”. Parents, we have both 50 SPF and 30 SPF sunscreen plus cases of water n the office for kids to use and all of them have taken us up on the offer. You might not be able to recognize them through their deep tans when they come home in a month. Angie covered W.B. Yeats in class and the students discussed and analyzed some of his works. Miles distributed more pearls of wisdom in Irish American History. 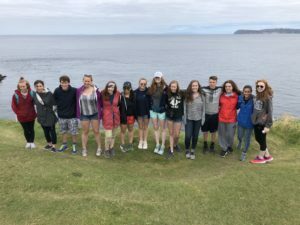 Mike ran the students through more bits of Gaelic — and the students have a very fun upcoming game of Gaelic twister that I still remember fondly to this day. 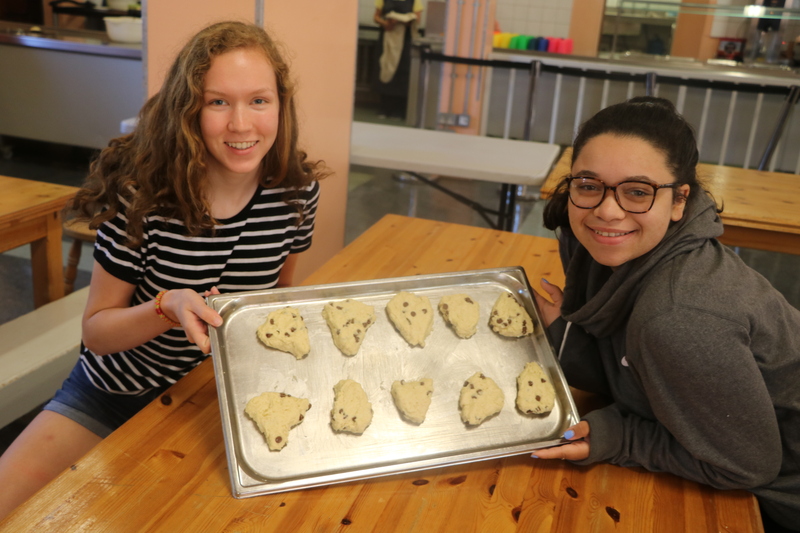 For Taryn’s class, we mixed (ha ha) things up a bit and the students made scones for everyone to eat. They had to option to add raisins or chocolate chips, and after dinner the lovely kitchen staff pulled them from the ovens for us! Taryn was a bit worried because some of the batches of dough was a bit runny but they came out a light, perfect golden brown. They were really good and had a great, traditional scone texture. 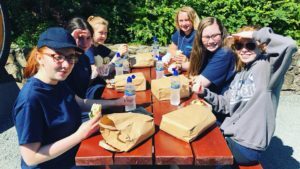 Then before we knew it it was time to break for lunch and then the students had free time in the city of Waterford. For those interested, Casey also offered her Celtic cards workshop. 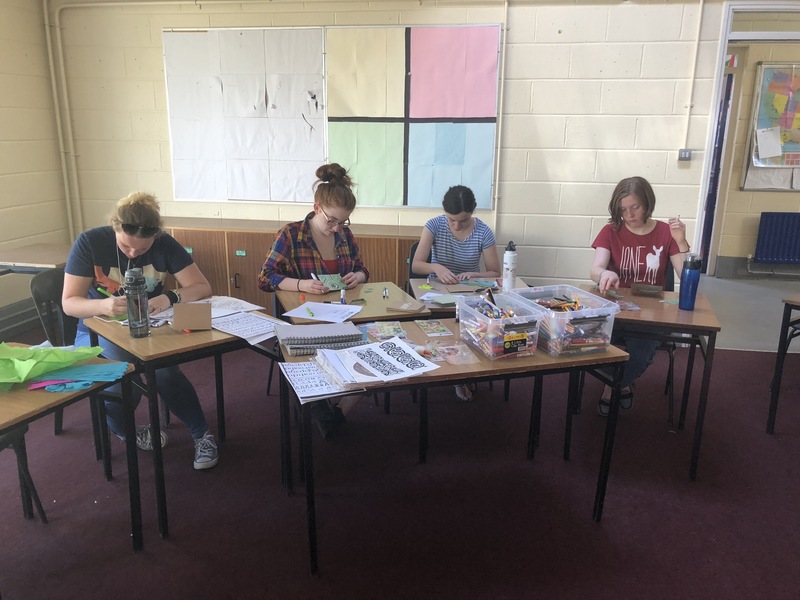 Nancy, Anya, Bella and Mairead all took advantage of this lovely opportunity to unleash their creativity into special creations for friends and family! Casey had loads of stickers, stencils and different papers for the girls to use and their cards came out absolutely lovely. We the staff used today as our opportunity to start planning and shopping for a fun activity we are planning for Dublin involving thriftshopping… While out and about, the staff ran into several students out shopping at Penney’s, which is the discount clothing store that is always a hit with the kids! After dinner, we had drama and dance. 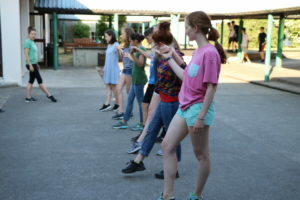 Casey began teaching students the complex Haymaker’s Jig which utilizes all of the separate elements of dance that the students have learned so far. In drama, we are creating student-made-and-directed music videos for some traditional Irish songs including I’ll Tell Me Ma, Molly Malone and Wild Rover. To wrap up the night, Casey held our traditional scavenger hunt in Waterford. The students divided up into four groups and set off for an hour of scavenging. 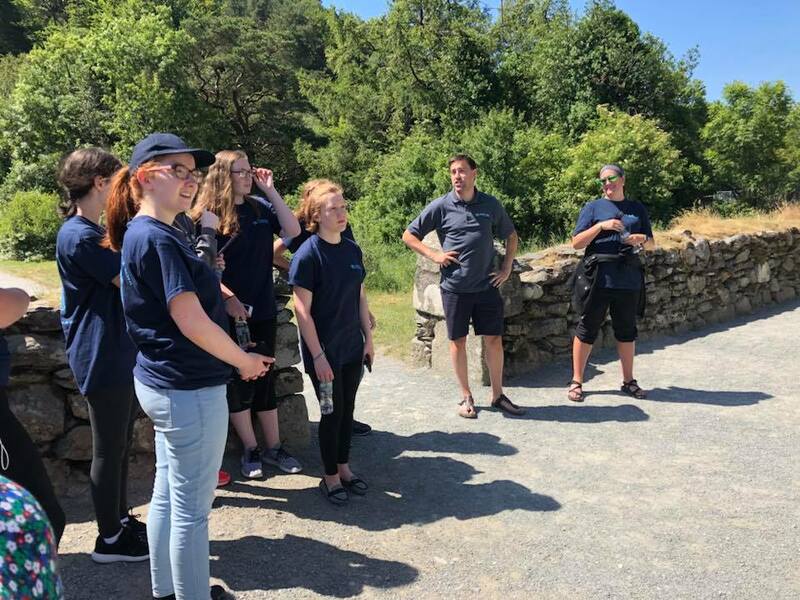 Some of the challenges included finding a business with the same name as a team member, a postcard with a sheep on it, and asking a local to tell them a joke which they had to recite for everyone later. But in the end, only one team could win the scavenger hunt and that team was Anna, Issie and Kennedy. Congrats, girls! They got bragging rights to match their Waterford flags. Keep checking our blog, more is coming!